Dr. Stephen Johnson is a gifted therapist and a master facilitator for the experiential journey that unfolds during his counseling sessions and workshops. He is a skilled, and seasoned psychotherapist who has the sensibilities of a wisdom teacher. Dr. Johnson is able to provide a safe space for freedom of expression in accessing one’s pain while fostering transformation, personal expansion and spiritual growth. 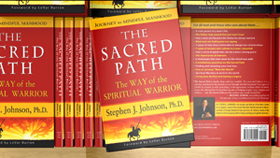 WRITTEN BY: Stephen J. Johnson, Ph.D.
Watch the video trailer of Dr. Stephen Johnson discussing the Sacred Path: The Way of the Spiritual Warrior ( Journey to Mindful Manhood ). Interviews with Actor/Director LeVar Burton and Author/Therapist Candace De Puy, Ph.D.
You can see all of Dr. Johnson’s videos on his youTube channel by clicking the icon below.